Well done to the Captain’s Lane artists at the Bathers Beach Art Precinct on Fremantle’s historic Arthur Head for creating such a great atmosphere at the first CAPTAIN’S LANE SUMMER FEST on Saturday evening. The lane had been transformed into an art market and the studios and galleries were open, while the Junkadelic, The BIZ, Miss Mary and Co and Latin dancers entertained the appreciative crowd. There is another Captain’s Lane Summer Fest in a fortnight, so book it in! There is no reason to be bored on this long weekend Saturday as there is quite a bit on in Fremantle. The Captain’s Lane artists in the Bathers Beach Art Precinct are having a free festival from 5-9 with live music, stalls and open studios. Down at the Fibonacci Centre the UKENDOIT ukelele group will be jammimg with other uke bands and the Blinco Street Cafe will have pizza for sale. BYO and only $ 5.00 entry. 7-9.30 pm. Tomorrow the BIG Growers Green Farmers Markets will be on with a huge variety of goods on offer. It’s on from 8-12. 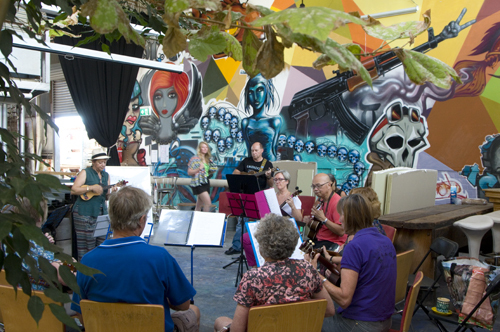 The Urban Adventure Race is also on around Arthur Head from 8 on Sunday morning and in the afternoon the Fremantle Arts Centre courtyard music will feature The Darling Downs from 2-4 pm.. IT IS ALL ABOUT PRIORITIES! Questions were raised on the Fremantle Reform blog about a “junket’ and the relevance for Freo for Fremantle Mayor Brad Pettitt to join a European liveable cities tour. I am in general sceptical about sustainability experts telling everyone to get out of their cars and walk or cycle, whilst they themselves fly all over the world to catch up with other experts, who also tell people in their countries to reduce plastic bags, etc. I believe video conferences are far more environmentally friendly than jumbo jets. Whatever a mini city like Fremantle does about sustainability will have next to no impact at global level, but I have no problem attacking the problems at grass roots, as long as we are aware about the minute impact our actions have. My concern with Brad Pettitt wanting to go to another sustainability event is that the Freo Mayor does not have his priorities right. The environment might be his career and passion but as the Mayor of our City he should be far more concerned about the things he can change, such as the local retail economy, but did the Mayor ever apply to go on an interstate or overseas “junket” about shopping, high streets, the changes in consumers’ attitudes, etc? I understand the desire to play in the big leagues of life, but as the Mayor of a small local council I would love to see Brad Pettitt be more nationally and internationally active to see how other councils around the world deal with the demise of so called High Streets and a steep decline in retail shopping. I would see that as worthwhile trips that could really benefit Freo, and it is an area that Council can pro-actively engage in and improve. Leave saving the world to the big boys, Brad and concentrate on the essential small things Fremantle needs to improve in. It took four powerful tug boats and the ships engine to pull the MAERSK GARONNE container vessel off the sandbar just off the South Mole at Fremantle port. The fifth tug that rushed to support was not needed and the Garonne headed off at 8.30 am out to Gage Roads, presumably waiting for high tide this afternoon and have a second try at berthing. The large cargo vessel MAERSK GARONNE has run on ground early this Saturday morning just off the Fremantle South Mole. It was due at berth in Fremantle Ports at 5 am but missed the channel into the port and it looks like it came in too far to the south. Three tug boats are trying to pull the 292-metre long ship off the sandbank but it is fully loaded and has a tonnage of 50757, so it probably needs very high tide and a good bit of horsepower to get it floating again. I was very surprised to read the spread about development in Fremantle in the West Australian yesterday as there is nothing new in the article, but for the fact that reporter Kate Emery calls the old railway bridge the Queen Victoria Street bridge. The article is one big PR promo for Fremantle with little substance and I suggest the City sticks to promoting the great things that are actually happening in Fremantle, such as the Hilton and Quest hotels, Atwell Arcade, the Fort Knox Heirloom development, MSC in Cliff Street, other development along Beach and Queen Victoria Street, Knutsford Street, Kim Beazley site, Bathers Beach activation, the probable development of the Woolstores shopping centre, etc. There is plenty of good news and there is a sense of positive anticipation about the future of Freo in the community, so there is no need for spin and false hopes about Kings Square. For the time being Kings Square is like flogging a dead horse, even when Sirona Capital refuses to call a three-year delay a delay. With the present office vacancy rate in Perth and many thousands of new square metres of office accommodation becoming available soon, the likelihood that Housing will move to Fremantle is unrealistic. High property prices and rent in Fremantle mean we can’t compete with reduced rents in Perth and West Perth and with the cheaper Midland, Cockburn, Joondalup, etc. That is probably the reason we hear little about the Victoria Quay development because Fremantle Ports might have realised this is the wrong time to release land for development. When well-managed companies like Atlas Iron are on a deep decline we have to see the signs that a mining resources recovery is still a long way off and there won’t be a big demand for high quality and large space offices. In a perfect world Sirona should get started on the smaller Spicers site first and leave Kings Square till the time is right for it, to at least restore some confidence in that big CBD development. The big problem I see with the Transformational Moves document is the reliance on State, Federal and private sector funding, so it is a mere wish list and not based on realistic outcomes and economic reality. 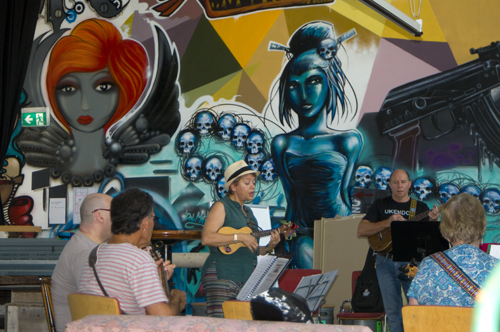 It’s little wonder that the Fremantle PRINCESS MAY MARKETS have some of the best live music of all markets around. It’s after all organised by Tom Fisher who just got back from playing with Tim Minchin on the steps of the Sydney Opera House. Tomorrow night the African soul sounds of Zakhutha will permeate the air of the lovely park next to Clancy’s so come along and start your long weekend at the PMM! There will be international food aplenty and entertaining stuff for the kids to do as well and there will be market stalls to have a bit of a browse. There is heaps of street parking so no worries about that. Come and support the local small businesses who make community events like markets work. Open from 5-9 pm every Friday! 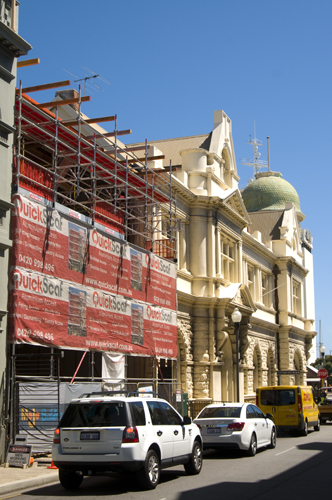 Work is progressing well on the new office building of the Mediterranean Shipping Company-MSC in Cliff Street, Fremantle. North Fremantle architects Murray Slavin designed the new building that will be connected to the old building on the corner and become accommodation for hundreds of MSC staff. It is due for completion later this year around September. 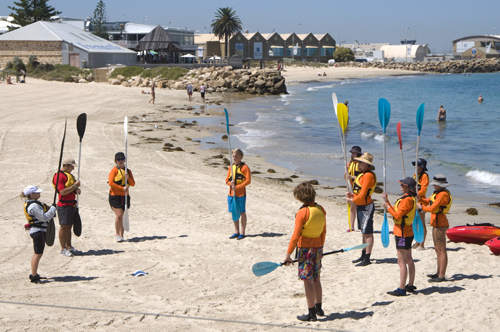 It is nice to see Fremantle’s hidden treasure Bathers Beach being frequented more often by more people. I took these photos of the ‘mermaid’ and Challenger TAFE students yesterday morning.